We wanted to be a part of history in the making, so we attended the first day of the International Convention in Detroit June 6th, 2014. 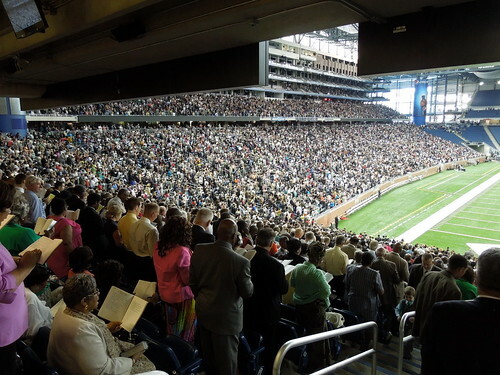 We had been in Christian Conventions in Detroit before with over 60,000 in attendance but we were much younger back then and did not notice the walking as much. This one in Detroit was attended by 35,000 the first day, and they said the attendance with the other ten sites added in was 98,000, (we were all tied in together with some of the talks given at Detroit). We arrived there early and we still had to park in a handicap area that must have been at least ¾ of a mile from the stadium. We were blessed to be able to get on one of the golf carts the brothers had running to carry in the elderly. We were put in line to get into the stadium at about 7:15AM and the lines from the north and south were both at least 1000feet long of brothers and sisters. When the doors opened at 8:00AM it still took a long time to get in because each person had to go through a security bag check. After entering, we traversed half-way around the entire football stadium just to find out that the meager portion of handicap seating was already taken. I finally helped Pam down a few steps and got her to a seat and just found a place to park her walker. The brothers were very kind and helped the handicap all they could despite not having enough wheelchair space. By the time the session was over, there must have been a dozen other walkers piled on top of Pam’s because we did not have enough room. Despite all that, the fellowship and joy was wonderful. Seeing and talking with the International delegates along with the wonderful talks made everything very worthwhile. The seats we had were right beside some wonderful delegates from Germany and there were small television monitors right above us. This made it easier to see even though they had the program projected on the high definition large stadium screens, since we were way back in the far end zone opposite the stage. For some reason though when the session was over, there were so many buses that they would not let them park to load very close to the stadium. We hiked back to the car, over a mile from our seats, and we still saw thousands of brothers, sisters, and elderly hiking another mile further to their buses. Even though we had finally made it to our car so we could sit down, the crowds of friends were so thick that we could not move if we wanted to. A brother finally came over and said we have to help you out of here because they need the parking for a ballgame; so he helped us get out very slowly and safely, as other cars for a ballgame were coming in. We just felt so heartbroken for so many friends walking so far. Some of the buses had to be at least two miles from the stadium entrance. Pam’s leg was so swollen when we got home she could not even get her shoe off. But again, we were happy to be there, as the talks were encouraging and wonderful, and we were part of history in the making. The love of the brothers and sisters moving around in such a respectful, peaceful and orderly crowd was so wonderful. The drama was so very good and instructional for true Christians. Jehovah blessed all despite the difficulties, and our joy felt great.